10 A None No Power Seat 10 A is a standard Economy class seat that has extra legroom due to the missing seat in front. However, there is no floor storage for this seat. 10 F None No Power Seat 10 F is a standard Economy class seat that has extra legroom due to the missing seat in front. However, there is no floor storage for this seat. 14 F None No Power Seat 14 F is a standard Economy Class seat that is missing a window. 23 B None No Power Seat 23 B may have limited recline due to the exit row behind. This seat is preferred by passengers traveling in couple since the absence of a third seat is offering more privacy. 23 C None No Power Seat 23 C may have limited recline due to the exit row behind. This seat is preferred by passengers traveling in couple since the absence of a third seat is offering more privacy. 23 D None No Power Seat 23 D may have limited recline due to the exit row behind. This seat is preferred by passengers traveling in couple since the absence of a third seat is offering more privacy. 23 E None No Power Seat 23 E may have limited recline due to the exit row behind. This seat is preferred by passengers traveling in couple since the absence of a third seat is offering more privacy. 24 A None No Power Seat 24 A has extra legroom due to the exit row ahead. The tray table is in the armrest, making the armrest immovable and slightly reducing seat width. There is no floor storage during takeoff and landing. 24 B None No Power Seat 24 B has extra legroom due to the exit row ahead. The tray table is in the armrest, making the armrest immovable and slightly reducing seat width. There is no floor storage during takeoff and landing. 24 C None No Power Seat 24 C has extra legroom due to the exit row ahead. The tray table is in the armrest, making the armrest immovable and slightly reducing seat width. There is no floor storage during takeoff and landing. 24 D None No Power Seat 24 D has extra legroom due to the exit row ahead. The tray table is in the armrest, making the armrest immovable and slightly reducing seat width. There is no floor storage during takeoff and landing. 24 E None No Power Seat 24 E has extra legroom due to the exit row ahead. The tray table is in the armrest, making the armrest immovable and slightly reducing seat width. There is no floor storage during takeoff and landing. 24 F None No Power Seat 24 F has extra legroom due to the exit row ahead. The tray table is in the armrest, making the armrest immovable and slightly reducing seat width. There is no floor storage during takeoff and landing. 34 A None No Power Seat 34 A is in the last row of the plane and may have limited recline. The proximity to the lavatory and galley may be bothersome. 34 B None No Power Seat 34 B is in the last row of the plane and may have limited recline. The proximity to the lavatory and galley may be bothersome. 34 C None No Power Seat 34 C is in the last row of the plane and may have limited recline. The proximity to the lavatory and galley may be bothersome. 34 D None No Power Seat 34 D is in the last row of the plane and may have limited recline. The proximity to the lavatory and galley may be bothersome. 34 E None No Power Seat 34 E is in the last row of the plane and may have limited recline. The proximity to the lavatory and galley may be bothersome. 34 F None No Power Seat 34 F is in the last row of the plane and may have limited recline. The proximity to the lavatory and galley may be bothersome. 4 A None No Power Seat 4 A has slightly restricted legroom due to the bulkhead wall. There is no floor storage during takeoff and landing. This seat is a bassinet location, so passengers traveling with infants are often seated in this area. 4 B None No Power Seat 4 B has slightly restricted legroom due to the bulkhead wall. There is no floor storage during takeoff and landing. This seat is a bassinet location, so passengers traveling with infants are often seated in this area. 4 C None No Power Seat 4 C has slightly restricted legroom due to the bulkhead wall. There is no floor storage during takeoff and landing. This seat is a bassinet location, so passengers traveling with infants are often seated in this area. 4 D None No Power Seat 4 D has slightly restricted legroom due to the bulkhead wall. There is no floor storage during takeoff and landing. This seat is a bassinet location, so passengers traveling with infants are often seated in this area. 4 E None No Power Seat 4 E has slightly restricted legroom due to the bulkhead wall. There is no floor storage during takeoff and landing. This seat is a bassinet location, so passengers traveling with infants are often seated in this area. 4 F None No Power Seat 4 F has slightly restricted legroom due to the bulkhead wall. There is no floor storage during takeoff and landing. This seat is a bassinet location, so passengers traveling with infants are often seated in this area. 9 B None No Power Seat 9 B has extra legroom due to the exit row ahead. The tray table is in the armrest, making the armrest immovable and slightly reducing seat width. There is no floor storage during takeoff and landing. 9 C None No Power Seat 9 C has extra legroom due to the exit row ahead. The tray table is in the armrest, making the armrest immovable and slightly reducing seat width. There is no floor storage during takeoff and landing. 9 D None No Power Seat 9 D has extra legroom due to the exit row ahead. The tray table is in the armrest, making the armrest immovable and slightly reducing seat width. There is no floor storage during takeoff and landing. 9 E None No Power Seat 9 E has extra legroom due to the exit row ahead. The tray table is in the armrest, making the armrest immovable and slightly reducing seat width. There is no floor storage during takeoff and landing. On certain routes, each seat is equipped with a personal TV with Audio and Video onDemand that features 30 movies, 40 short films, and games. There are 36 of the Airbus A321 in the Turkish Airlines fleet. This aircraft operates on short to medium-haul flights, with 12 seats of Business Class and 176 seats of Economy Class. 2017/11/30 IST-AMS. Very little knee room and I'm only 5ft 6in (168cm). Pocket too small for even a small water bottle. Seat very narrow, so if person in B (and likely E on other side of aisle) is even slightly large-ish, they spill over into your space. View from window is good. Terrible plane; not suitable for medium/long haul as my flight was. No entertainment and no space. Also my seat didn't even recline! These planes should be short haul internal use only. Great service, best entertainment interactive screen and lots of movies. Great food. A bit smaller for leg room than larger planes. Still, way better than any other airline as a whole experience. Vile business class - no tv - very disappointing. Terrible business class seats!! Hard ! No space for my legs! I am 190 cm ! Could hardley bent my table! Food was great ! Not worth at all to pay business for this short distance from amsterdam to istanbul ! This aircraft at a "true" business class product. 20 Total seats in 2x2 configuration. (A320 earlier in the week had the "European Biz class" with middle seat folded down). I flew on 737-800 back in May and I had the "real" biz class cabin. I guess on the narrowbody fleet, you never know what you are going to get, but I find this carrier just great! No legroom at all. I am not extremely large (1.82 m), but my knees got stuck against the seat in front of me. No fun in a 5.5 hrs flight DYE-IST (6 hrs including delay). 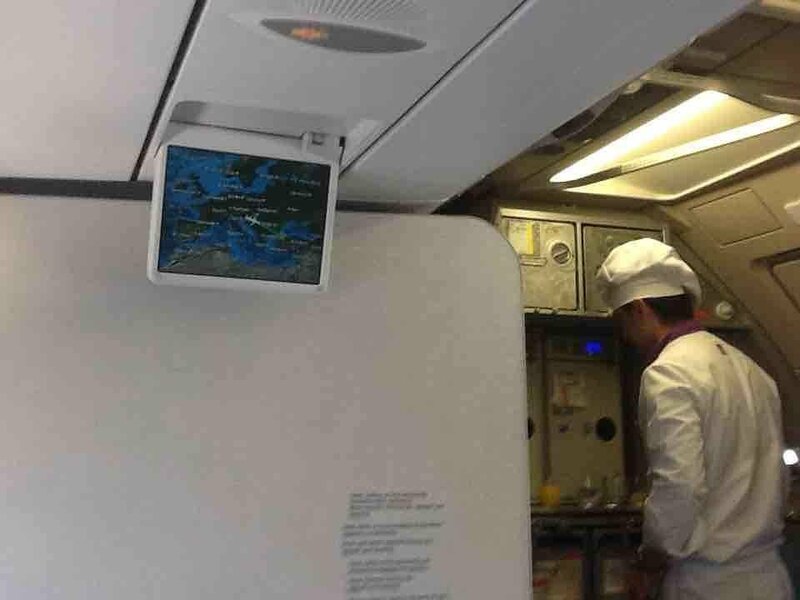 No IFE either, just a few small overhead screens. My next leg was on another Turkish A321-200 (TK1957, IST-AMS), but that one was newer and MUCH roomier, and with personal IFE. Awful seats in economy. Incredibly cramped. We were packed in like sardines. Sat for 3 hours in the heat on the tarmac because of congestion before taking off. Were not even offered a glass of water at this time. Asked staff for wine with my meal when it was finally served. Was ignored by three fdifferent light attendants. Awful seats, awful cabin, awful service. One of the worst flights of my life. Never again. Avoid at all costs. 28F is a normal window seat on the older planes, but on the newer A321 (tailsign TC-JSN and onwards) there's a HUGE inflight entertainment box waiting for you to cut off almost half of the space originally designed to store your feet. 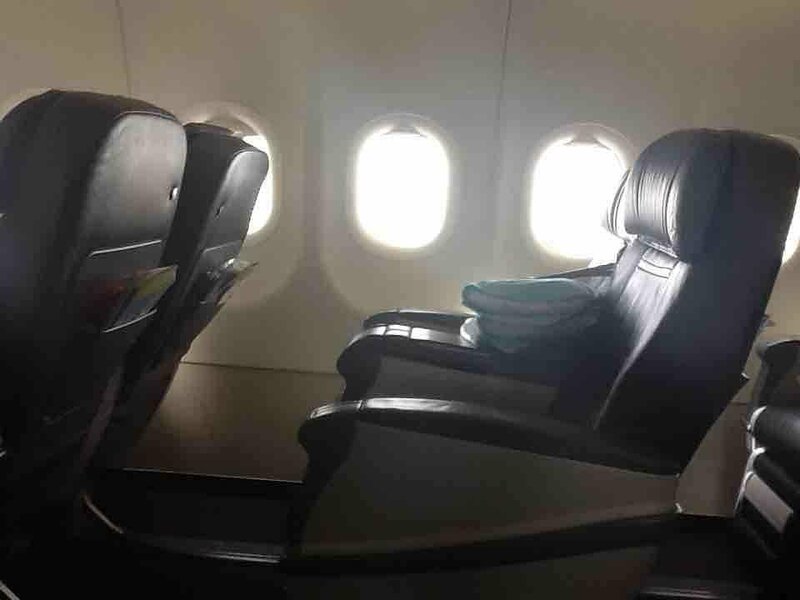 So better avoid this seat if you have two feet and you don't want to sit misaligned for the whole flight and also forget about using the IFE box as a footrest, it has sharp edges and you will be constantly kicking the person in front of you in the back. The same applies to all window seats at least in the rear cabin (maybe to the whole plane, but I didn't check that out). But, there might be a way to produce relief yourself if you're seated behind an IFE box: The box seems to be attached to the seat with regular hexagon socket screws, so just bring a set of allen keys and the problem might be solved. Couldn't give that a burst so far but I'll keep you updated on that issue. Besides the problem with the IFE box I really like TK, they have a good on-board product and great catering, I'm only actively avoiding flights on A321s if possible. Flight from TLV to IST. Had a different configuration from this seat map. Business class had 5 rows of 2 recliner seats on each side (not the 3 economy seats with 1 empty middle..). Pleasantly surprised. Quite comfortable for a short flight, good food (full meal-1st & main course) and good service. USB and electric port for each seat. Best entertainment system i have utilized so far in economy class seating. Very clear, very interactive and very easy to open and stow. Also like to add in increased the interior aesthetics of this airline model. I flew IST-LGW on my way back from Dhaka. I was worried about flying on this plane, but the A321 is more advanced than the A330! Slightly cramped plane, didn't have much legroom. Staff were all right, I guess. Food was actually nice, they gave us some vanilla 'panna cota' which was more of a custard, but it was delicious. I sat in seat 24A by the window. View was absolutely stunning, there were no clouds and I could see Europe below me at 39,000 feet. TV screens actually worked for once. Was quite happy with Turkish, might fly with them again. I went on this plane one week ago i was in seat 24. I loved that seat because you can see the wing of the plane very well and a nice view the,lavatory's were not far and cabin crew walked up and down the plane so u can order anything u need as well as the personal screens I got.it was amazing.recommend that seat a lot. Worst airline ive been on so far. My phones screen is larger than planes. Good thing i didnt pay the extra 2100USD for upgrade, business seats are exactly the same as Qatar airways economy seats. Turkish Airlines flies 2 versions of .